This month’s treasure comes from Special Collections and FIT Archives. 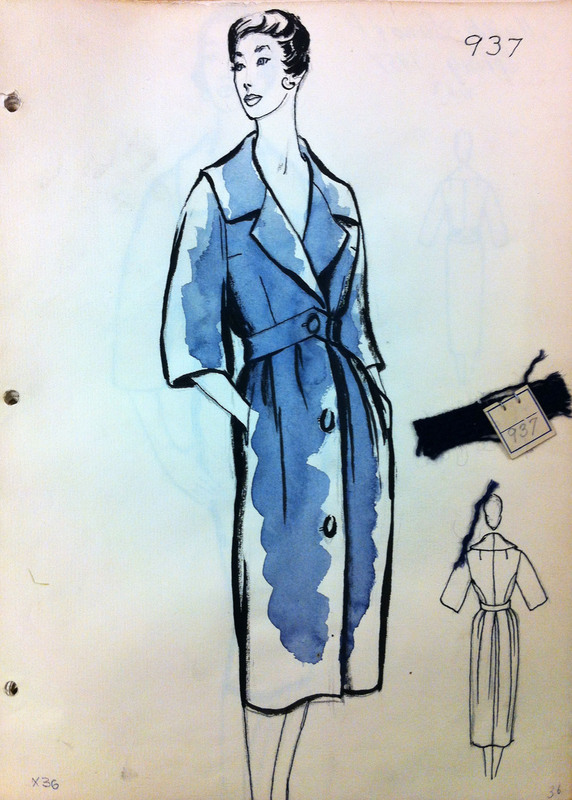 It features the wonderful sketches and swatches collection of the coats and suits manufacturer Monte Santo & Pruzan. 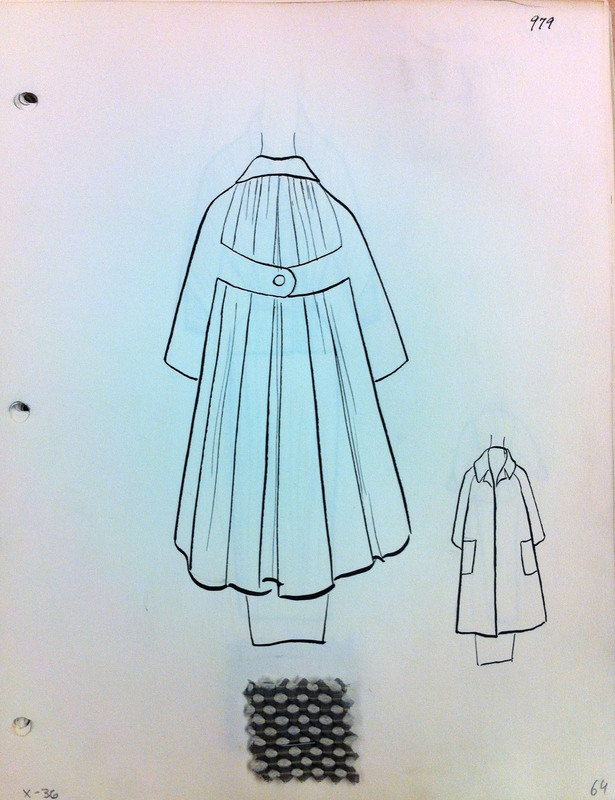 Monte Santo & Pruzan coat, 1957. Special Collections and FIT Archives. Vincent Monte Santo was the man who started it all. In 1915 he opened a costume tailoring house that specialized in woolen outerwear and suits for women. With the onset of World War II the ready-to-wear American market thrived, Seventh Aveneu replaced Paris as the supplier of chic and American women flocked to department stores. This may have been the impetus behind Monte Santo decision to abandon his private clientele and to become a wholesaler for department stores such as Lord & Taylor, Saks Fifth Avenue, and Bergdorf Goodman. During the 1950s Monte Santo was joined by Max Pruzan, and the company changed its name to Monte Santo & Pruzan. Their coats relied on the company’s long standing tradition of fine tailoring and retailed at high prices that equaled, if not surpassed, line-for-line certified copies of leading couture designers such as Dior and Balenciaga. 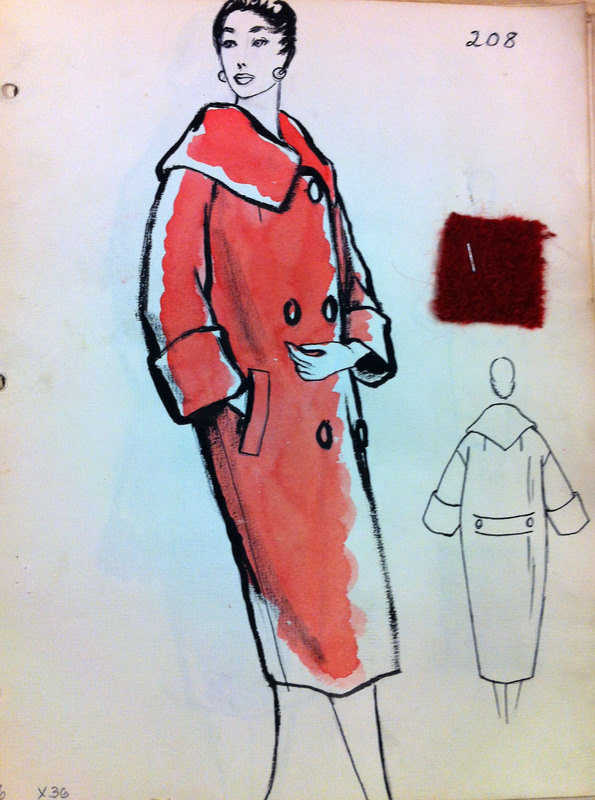 This coat for example sold at Lord & Taylor for a price that would have cost in today’s value almost $2,000. 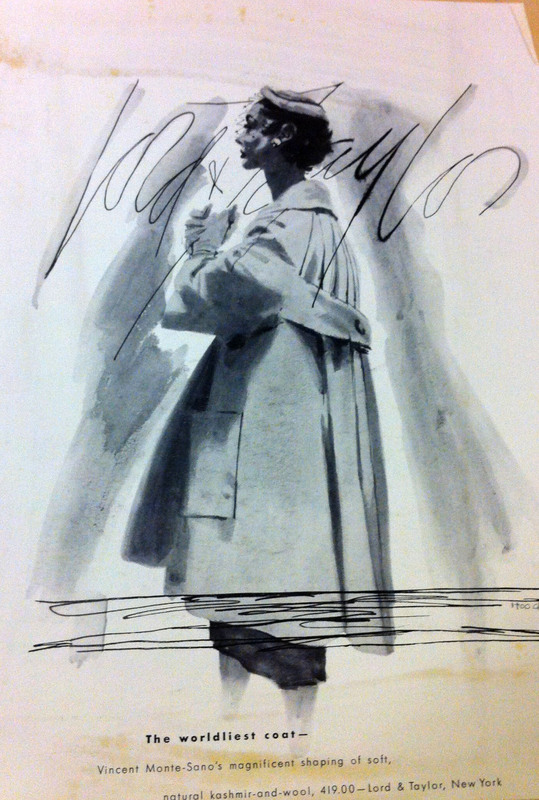 The same coat as it appeared in a Lord & Taylor advertisement in Harper’s Bazaar, 1954. Lord & Taylor scrapbook collection, Special Collections and FIT Archives. The perfect fit and beautiful wool fabrics were matched with stylish cuts and silhouettes. The influence of Balenciaga is evident in the sloping shoulders, the structured fit, and the simple yet sophisticated design details. For the better part of the 1950s the company employed French-born designer Jacques Tiffeau. The colorful Tiffeau, who was once Christian Dior’s lover, may have been the designer of these coats. Monte Santo & Pruzan coat and dress, 1956. Special Collections and FIT Archives. Pruzan retired in 1966, and the company dissolved in 1969. Tiffeau, who was awarded two Cotty awards and was a close friend of anyone who mattered in the world of fashion and magazine publication , is unfortunately not remembered today as the great designer he once was, but this is a topic for a totally different post. Monte Santo & Pruzan coat, 1956. Special Collections and FIT Archives. Special Thanks to Ariele Elia for her helping in researching and scanning the materials. The Department of Special Collections and FIT Archives’ mission is two-fold. Regarding Special Collections, it acquires, preserves, and provides access to a wide range of primary research materials in original formats and across many languages and geographical spectra. All acquisitions support one or more curricula offered at FIT. Regarding the College Archives, the Department acquires, preserves, and provides access to College records permanently-scheduled or of enduring value created in the course of College business by administrators, staff, faculty, and students. These efforts support myriad goals in and across FIT units as well as research from those outside the FIT community. In order to view these original works or other Special Collections materials please email: fitlibrary.sparc@gmail.com or call 212.217.4385 for an appointment. 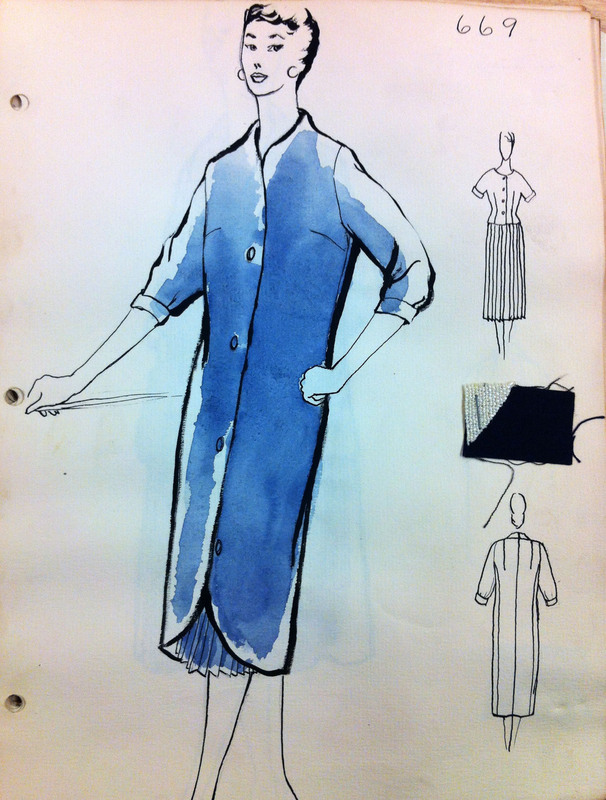 This entry was posted in Treasure of the Month and tagged 1950s fashion, 20th Century Fashion History, Cristobal Balenciaga, Jacques Tiffeau, Lord & Taylor, Monte Santo & Pruzan, Special Collections. Bookmark the permalink. I had the most gorgeous suit in the 1960’s….I still think about it.